The B-52 has been called many things from its official Air Force name Stratofortress to the acronym BUFF - Big, Ugly, Fat, and uh for our sake we’ll just say the last F stands for Fella. It’s been called reliable and old, two attributes that certain fit. One thing it isn’t, however, is outdated - and while it certainly looks the part compared to its B-1 and B-2 stablemates the B-52 has managed to hang on for decades in large part because its design was so deceptively cutting-edge. When the first flying B-52 (YB-52) prototype flew in 1952, the Jet Age was still this new and wonderous thing Popular Mechanics would slap on their covers all the time because FUTURE! Just a decade earlier the B-17 Flying Fortress and B-24 Liberator were the only game in town as far as American long-range heavy bombers were concerned and the best we could cook up to launch airstrikes at far away lands without available forward-deployed basing was to sling B-25s haphazardly from a carrier (in fact just three days exactly short of a decade from the Doolittle Raid). In the meantime a slew of jet-powered bombers had achieved operational service including the B-45 Tornado and Boeing’s own B-47 Stratojet (the little brother to the B-52). 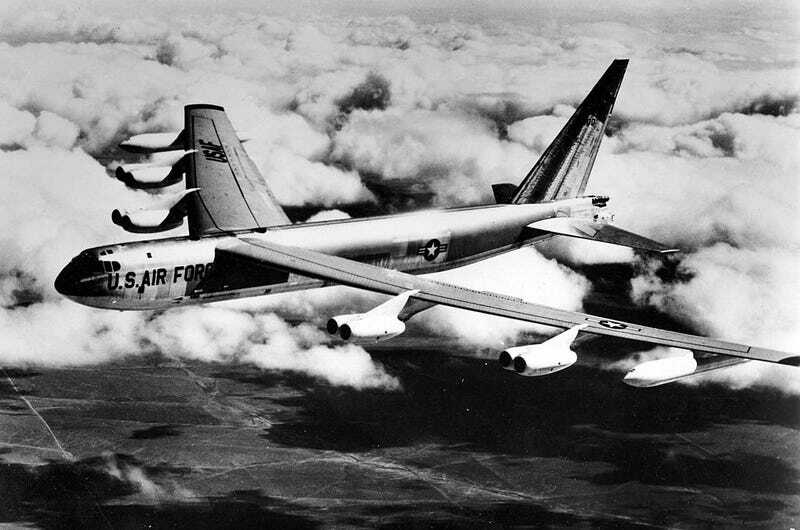 The premiere 50s long-range nuclear heavy bomber, the B-36 Peacemaker (if living up to its name means never seeing combat it more or less achieved success) had only been in service for a few years and its six massive piston engines had already doomed the plane to obsolescence. Already by that time, however, engineers had already figured out a thing or two. The top engineers of the country had been pouring over research data developed by the Nazis who were desperate to develop an Uberweapon to counter Allied air power and had tried all sorts of cockamamie configurations, many of which turned out to be on to something. That research had been elaborated on by an intense and concentrated effort to put theory into practice through the X-Plane program, and the fruits of such wild success meant a boom of advanced aerodynamic configurations becoming commonplace almost overnight. This didn’t mean that the B-52 represented an easy development path - it only meant that the aerodynamic theory of the aircraft had been well-proven to provide a high-performance platform capable of the prodigious range and bombload goals the USAF demanded. The B-52 combined high-speed research and recently acquired know-how into swept wing aircraft, high-output high-reliability jet engines and the most advanced structural engineering found anywhere to produce an aircraft that represented new benchmarks in speed, automation and size that even today have been tough to match. The J57 engines alone won the Collier Trophy for 1952, basically labeling them as aviation’s most important development that year and the design would later power the first jetliners, making fast and safe intercontinental and transoceanic travel possible. Many people look at the B-52 today and assume it’s outdated, that modern computational power somehow makes all the aerodynamic research and knowledge that went into the B-52 frame somehow obsolete or invalidated. As it turns out, aerodynamic principles are pretty solid and while computers have certainly helped us refine that data, the basics remain solid no matter what decade they date to. It’s been able to outlive not only its predecessors by a huge margin (the preceding B-29/B-50, B-45, B-47 and B-36 had service lives far less than half of what the B-52 has been able to serve) but also prospective successors such as the supersonic B-58 Hustler. The automation of the B-52 back in the 50s and 60s meant that the 10+ crew that had inhabited every bomber from the B-17 to the B-36 was reduced to just six. Those computer bits were upgraded to get rid of a further crew member, particularly as having defensive guns wasn’t much use against “double-digit” surface-to-air missiles and invisible, nonlethal electronic waves were more useful as a defense than deadly physical bullets. The B-2 and almost all jet airliners still flying have a crew of only two, but all things considered that’s still some pretty impressive crew reduction. When it comes to non-supersonic speed the B-52 is one of the fastest machines in the air and can sustain that speed for extended periods. What really makes that impressive is remembering that it’s about the size of several school buses thrown together. Of course, having eight engines tends to make anything pretty damn fast, but it also shows that the aerodynamic data of the plane remains absolutely solid. Many people look at the B-52 and conclude that its primary “bomb truck” mission must be pretty simple. After all, it’s just another metal tube with wings, right? Take the 747 for example, a design that has also been in production for a long time. Despite having comparatively little development costs, a brand new frame still costs not far off from half a billion dollars. The B-52 manages to be a bit smaller (about the size of a 757-300) but appreciation should be given to how complex and resource-intensive even a subsonic jet can be, especially one with eight engines and being as big as it is. The fact that the same basic design has been able to outlive most attempts to replace it should say something about the validity of its design. It represented a highly cutting-edge engineering effort for its day, and was so advanced and ahead of its time it has remained so 60 years later.